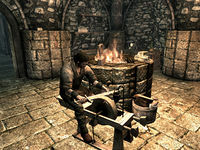 Solitude Blacksmith is a smithy in the western side of Solitude. It is worked by Beirand and Heimvar. The interior is quite large, and there is a decent number of things that can be stolen. Heimvar can usually be found at a grindstone downstairs. The blacksmiths are found within the grounds of Castle Dour, just outside the walls. It is found at the top of a ramp leading up from the market area. From the top of the ramp turn to the right. On the end of the wall separating the ramp from the blacksmiths is a shadowmark Loot. To the right of the entrance is a cart containing several cabbages and potatoes, and a gourd. Further along is the forge where Beirand can usually be found working. At the rear, against the wall is a wooden table with several items of Beirand's stock that will disappear when purchased. In addition to the forge there is a grindstone, tanning rack and workbench as well as several barrels of food all around the forge area. Upon entering you are in a wide room with a central pillar and a door to the residence opposite. On the right is a firepit, with a stone wall around it. There are three silver ingots on the top of the wall and a grindstone beside it. Above the firepit is a rack holding two rabbits. On your right as you enter, against the south wall is a barrel containing foodstuffs and eight iron ingots on top. Beside this is a set of shelves holding several cheese wheels, five potatoes, a cabbage and a couple of loaves of bread. In an alcove to the east are two large piles of firewood and a dresser containing clothes. In the northeastern corner are two small units holding a woodcutter's axe, two leather strips and a bottle of wine. On the north wall are two wall shelves holding fifteen iron ingots, two silver ingots and four steel ingots. To the left of these is the door to the residence and to the left of that is a small unit containing clothes with a rack holding two elves ears and three garlic braids. Further along the wall is a barrel of foodstuffs and a set of shelves holding four leather strips and two pieces of iron ore and in the northwestern corner a stack of more barrels containing food. Through the door into the residence on the left is a set of shelves holding several cheese wheels, a cabbage, five potatoes and a potion of regeneration. On the right is a table and chairs set for two, with two cups, two portions of grilled leeks, two seared slaughterfish, some bread, an eidar cheese wedge and a bulb of garlic. Above the table are three wall shelves holding two goat cheese wheels, several cups and a bunch of tundra cotton. Directly opposite the door against the northeast wall is an alcove containing several barrels of food, a table holding two leather strips, three iron ingots and a cabbage, with an unlocked chest underneath and a bale of straw behind. Beside the table is basket containing two cabbages and five potatoes. To the east is a door into Heimvar's bedroom, which contains a tall wardrobe on the right as you enter, against the north wall a narrow table holding an iron dagger and a bowl containing a deathbell flower and bunch of tundra cotton. Above this is a wall shelf holding three common books. Against the east wall is an empty set of small shelves. There is an unowned single bed in the southeastern corner with a wall shelf above on the east wall holding two leather strips. There is an open crate at the foot of the bed containing a bunch of tundra cotton and to the right of the bed is a table holding a cup. The stairs up to the top floor are to the west, with a barrel of food on the left of them. At the top of the stairs against the north wall is a small cupboard with a jug on top. Opposite the top of the stairs is a door into Beirand's bedroom. To the right of this is a cooking pot on a stand, with a narrow table to the right of this, holding a bowl of bread, a plate holding a sliced eidar cheese and an iron dagger. Above these is a wall shelf holding one iron and one steel ingot. Against the south wall is a bookcase holding a potion of health, nine common books, a flute and a drum. In front of this is a low table and chair holding a common book, a goblet and a plate of bread and cheese. 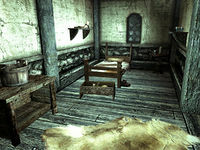 Beirand's bedroom consists of a single unowned bed in the southeastern corner, a wardrobe on your left as you enter the room, a small unit against the east wall holding a leveled locked strongbox and a plate of bread and cheese. In front of this is a low table and chair holding the business ledger, with a wooden bench against the north wall. Further along the wall is a narrow table holding an iron dagger and bowl containing a bunch of tundra cotton. Above this is a wall shelf holding a bowl of void salts and a copy of the Light Armor skill book The Refugees. Against the west wall is a tall set of shelves holding two slaughterfish scales, a bowl of glow dust, two bottles of frostbite venom, a deathbell flower, a bowl of void salts and a basket containing two bunches of lavender. The Blacksmith sign when ran and jumped into may make you suddenly end up in a large body of water with nothing around you. When checked on the map it tilts the map upwards as if you were in the sky. ? Heimvar is officially the backup blacksmith for Solitude Blacksmith. 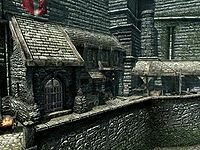 However, Heimvar is not set up properly, meaning that if Beirand dies there is no longer anyone who will provide blacksmith merchant services in Solitude.